Having contents that are just sitting there collecting dust and not ranking can be a heartbreaking thing. Especially since you have spent hours crafting, editing and perfecting it, only to click publish and finding out that it’s not even ranked in the top 10 results in Google Search. Everyone knows how important it is to keep pumping out fresh contents, but revamping your old effort can also bring you a positive bump ranking wise. Revamping your old contents to fit in more updated information filled with more relevant keywords is less effort than creating new ones and can bring a significant difference to your SEO. 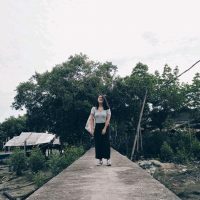 So, what is the first step to work on revamping your old content? The answer is SERP analyzing. Introducing WordGraph – The Word Vector tool that compares you with the Top 10 in SERP. Our good friend Brandon has created a no-nonsense, straight to the top of the SERP word vector tool, WordGraph. Ever wondered why and how other websites are ranking for your keywords? What are the keywords that helped place them in top 10? How to revamp your content using high priority keywords to rank? Have all your questions answered in WordGraph – The World’s First Intelligent Word Vector Tool. they are obviously having the correct keywords and contents that are both useful for their visitors and also gives a strong positive signal to the search engine. You need to revamp your old content to match and up the search game by taking notes of what’s working from your competitors. The process can be meticulous and time-consuming, but I have found a great tool that can automate the whole process for you. WordGraph gives you the keyword composition that can help your content to rank by analyzing those pages that are currently ranking in top 10. They do this by asking for your targeted keyword then the URL of your content. The tool does this cool thing where they run content gap analysis and the top 10 ranking pages, then put them side to side to compare how good of a chance you have to break into top 10. Then, you get a list of keywords in your content that can help you rank. You also get the full keyword composition for each of the pages ranked in the top 10 results. I used to analyze the top 10 results for my keywords manually (…and painstakingly but hey, you gotta do what you gotta do). I’ll take notes on what common topics that they mention, what about the other related topics? Did the readers make any comments and asked any supplementary questions? That can help me gauge what keywords I can use to rank. 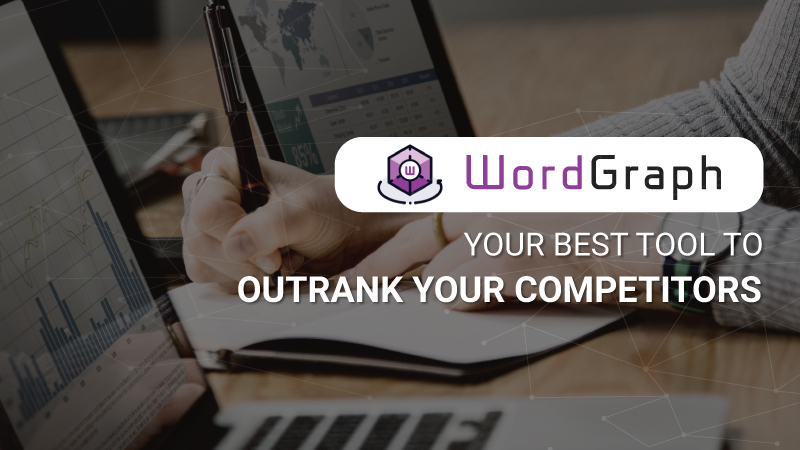 But now, WordGraph will automate the whole content gap analysis process for you by presenting you the Word Graph to rank for your content revamp effort. WordGraph uses advanced contextual analysis method in Natural Language Processing, Word2vec, and Co-occurrence. A little note on Word2vec: Two words that have close proximity in the vector space tend to share a common context; whereas two words that are far from each other are regarded as not contextually related. Back to the tool, WordGraph is trained using a carefully designed Machine Learning Framework to understand the content not only semantically but also pragmatically. By analyzing those already ranking, they present you with the list of the most competitive and valuable keywords that answer search intent, thus sending your content to the top of SERP. You’re basically scraping your competitors’ keyword research and planning effort to use it as your own. And you know it is going to work because they ARE already in the top 10 ranking. 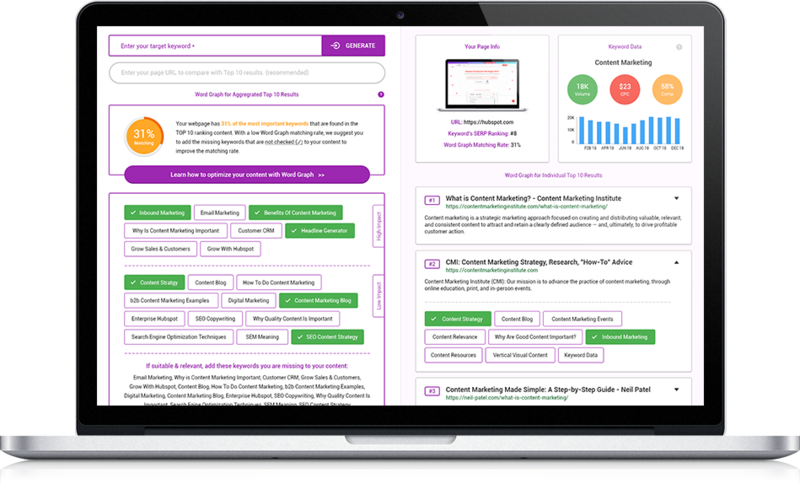 Improve your content based on the WordGraph score and metrics presented, backed by a contextually and mathematically calculated keyword and content gap analysis. The cool thing about WordGraph is, it really can understand the content on the pages like we, human, would. Syntax rules? Checked. Lexical and logical semantics? Tick that off too. Pragmatics? Nailed. Be it misspellings, duplicates, abbreviations, or different word placement, WordGraph can understand that they actually mean the same thing. Using WordGraph means cutting out a huge chunk of work for content creators, webmasters, digital marketers like us. Now that we have our keyword research and planning done for us, we have much more time to spend on actually crafting and perfecting the content. Revamping old content starts with analyzing. Not only your own content but also those ranking in the top 10. By using word vectors and WordGraph’s content gap analysis, all is solved. You need to Understand what you’re missing, that is the main point for a successful revamp. WordGraph is a handy tool that greatly lifts the burden of analyzing your competitors content off your shoulder. And leave you with more time to work on the actual revamping instead. Humans are prone to errors, but machines, not so much. The world of search is a weird mix of human needs and machine analysis, you can be the human part of this equation while Word Graph can speak machine for you instead. Don’t leave your old contents collecting dust, revamp them with high priorities keywords to rank and they can be your next lead generation powerhouse. 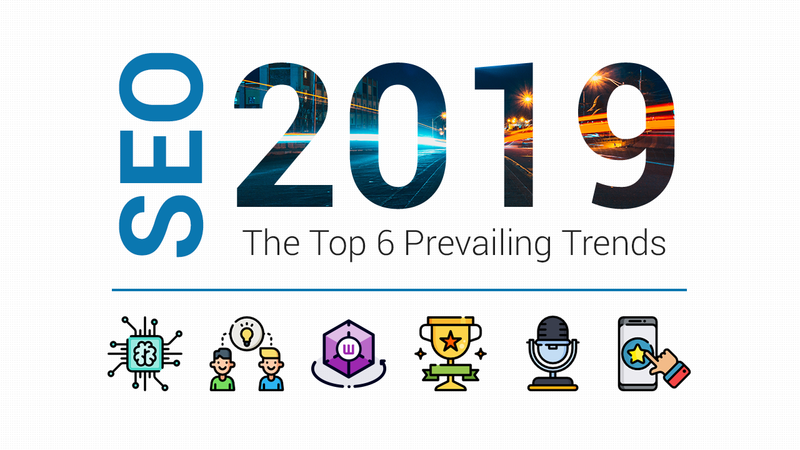 Before you go, if you’d like to read more on WordGraph / Word Vector and how it’ll impact SEO in the coming year, you may read it from here – 6 Untold SEO in 2019 Trends To Watch For.